An all-terrain vehicle is an investment in fun and enjoyment for years to come. Unfortunately, ATV theft is a real concern for any owner. Since most states do not require you to register your ATV, thieves target them to steal, file off the VIN number, resell it to a buyer, and no one is ever the wiser. Here are a few tips on ATV security to prevent this from happening to you. Get insurance: One of the less obvious yet most important things you can do regarding ATV security is to get insurance. While most states do not require insurance for ATV in the same way they do for cars or trucks, having insurance on this item can help later in the event of a theft. If you insure your ATV, you can get back all or some of the cost for a replacement if someone steals it. Best of all, there are several insurance options on the market so that you can find the one that works best with your budget and coverage needs of your ATV. 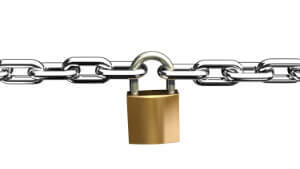 Chain and lock it: When looking to secure your ATV and safeguard it from theft, a chain and lock is the first line of defense. By chaining your ATV to a tree or other sturdy structure and then securing it with a lock, you make it harder for a criminal to simply ride off into the sunset with your ride. Of course, there are chain cutters, so this isn’t a fool proof system, but the thicker the chain, the harder it is to cut. You can also opt for chains that are braided cable chains which are harder to cut. The lock should be high quality and reliable as well. If you use a thick chain with an easy to pick lock, you just made it easier for thieves to steal your wheels. Install a handle bar lock: A handle bar lock is another option for upping the security features of your ride. This add-on acts like a clamp on the handlebars and essentially closes the brake lever closed and then holds to the handle bar. The lock is impossible to release without turning the key in the ignition which means no one can steal your ride without the key itself. Install a tracker: While installing a tracker won’t prevent the theft, it can help you easily and discreetly recover your ATV from the thief. A GPS tracker can be placed on the underside of the vehicle and you can even choose trackers with real time tracking, so you can find your vehicle before they strip it for parts. Best of all, there are trackers for a range of budgets and preferences as well as options you can track directly from your phone for added ease. Remove the tires: One of the most common tips for ATV security is to remove the tires to make it harder to steal. This is ideal if you are in the off season of riding or don’t use the ATV as often. An all-terrain vehicle is a lot harder to steal without any tires. Remove a few important fuses: If you do ride your ATV a lot and want to remove something a bit easier to put back, removing a fuse or two is a good course of action against theft. If you removed a fuse to an essential component like the fuel pump, the vehicle won’t start up and will be harder to steal, and then you can pop the fuse back in and ride when you are ready. Store it in a locked garage or storage unit: The best way to protect your ATV is to properly store it in a designated location that is secure and safe. A locked garage or storage unit is your best bet. For maximum security, you can even install floor locks in your garage which you can then use to chain the ATV to the ground for added peace of mind.